Priceline came back from the edge to be a huge success story. The rise of the internet in the late 1990s created new business opportunities throughout the economy, and the travel industry quickly became one of the most cutting-edge areas for technological innovation. Priceline Group (NASDAQ:BKNG) started out as a kitschy website with its auction format famously allowing users to name their own price for hotel rooms and other travel services. But over time, Priceline has evolved into a leading site for travel needs of all sorts, and its stock history shows the challenges that led to its doing a rare reverse split as well as the success that long-term shareholders who stayed the course have seen. Let's take a closer look at how Priceline got where it is today. As you can see above, Priceline went public at a time of high enthusiasm for internet stocks generally. After doubling in its first month after going public in early 1999, Priceline started a slide that would culminate in a decline of 99% within less than two years. At that point, it seemed like Priceline would simply become one of the hundreds of internet-boom has-beens that had quickly burst onto the scene and then flared out. Priceline shares remained locked in single-digit prices for several years, and the company finally resorted to a one-for-six reverse split in 2003 in order to get the stock price back above the $20 mark. In many cases, reverse splits mark a final last-gasp effort for a company to bounce back from tough conditions, and in the vast majority of cases, reverse splits only delay the inevitable decline of a business rather than helping it recover. Yet as you can see above, Priceline was one of the rare exceptions, steadfastly moving forward and sustaining its presence in the online travel industry. With shares trading around $1,500 right now, it's easy to think that Priceline's turnaround involved a straight-up move for the stock. 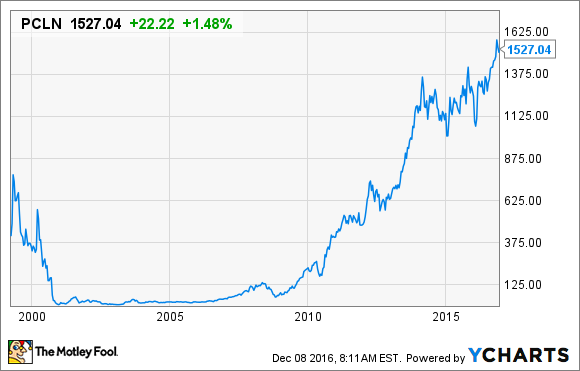 Yet for years during the mid-2000s, Priceline had a lot of difficulty breaking out of its rut. Competition in the online travel industry was fierce, and Priceline and its rivals all struggled to figure out how to create a unique brand awareness that could differentiate them from each other. Starting in 2006, however, Priceline started to find its groove. More rapid expansion in the overall economy gave travelers more leeway to book trips, and Priceline started to become a go-to site as the weeding-out process in the industry narrowed the field to just a small group of survivors. The recession of 2008 hit Priceline's stock just as hard as it did companies throughout the stock market, but it didn't take long after the financial crisis was over for the stock to start moving higher again. Since early 2009, Priceline shares have risen nearly 20-fold, and a couple of reasons explain the move. First, the international travel industry has developed immensely over that time frame, defying initial beliefs after the Sept. 11 attacks in New York City that global travel would succumb to terrorist fears. Even when the global economy has faced challenges and investors have worried that the success that Priceline has had in capturing international travel customers might evaporate, the industry has proven to be more resilient than nearly anyone would have anticipated. More specifically, Priceline has worked hard to stay ahead of its competitors. Rivals that focused on the U.S. market quickly found themselves lagging behind Priceline in the faster-growing international realm, and smart acquisitions like Booking.com and Kayak have broadened Priceline's appeal while fending off would-be competitors. Strategic investments have also opened up new areas for Priceline, and that could produce even more growth in the future. Looking ahead, Priceline still has work to do. The sharing economy has produced would-be rivals like Airbnb, and Priceline will have to make sure that it defends its turf from ever-evolving enterprises looking to cut out its intermediary services. Nevertheless, Priceline has been able to fend off competitive threats well throughout its history. Priceline's stock history is an unqualified success story and one that shareholders hope will keep moving forward for years to come.